Giant Robots everywhere in my life right now... having spent the last month or two playing Xenoblade Chronicles, I've been in the presence of some of the largest robot(-like entities) in any fiction I've come across. In that game, you guide an ensemble of heroes, drawn from various fantasy races, through a landscape entirely situated on the body of a massive humanoid creature, large enough that whole continents can protrude from its limbs and tissue. It places you, the protagonists, on the scale of bacteria, which is a pretty amazing speculative premise. And then, of course, there's the robot-kaiju film on everybody's tongue: Guillermo del Toro's Pacific Rim. As usual (or unusual, in the recent waning of my productivity), I'm going to use the film as a jumping-off point for some thematic observations. If you want to know how I liked it, I liked it. It was a fun, positive, humanistic action film that tapped into our adolescent monster worship without treating us with contempt. It was rich with detail and draped in vibrant production design, and its characters were glowing, sympathetic protagonists, free of cynicism, except for occasional comic effect. In terms of big themes, the film plays a lot with ideas of embodiment and the relationship between mind and matter. There is, in fact, a particular philosopher who explored these topics at length, and his work dovetails nicely with the devices in Pacific Rim. His name was Henri Bergson... and in recalling the film's motifs, I might actually go so far as to say the universe was kind of Bergsonian. Maybe talking about the parallels will help someone understand Bergson better, or maybe it'll shed some light on the film's universe. I'm lucky... for me, the guy working through these concepts, it did both. I'm not intimately familiar with Bergson, but from reading a chunk of his book Matter and Memory, I've come to understand and appreciate at least part of his philosophical project. Bergson was a grounded, practical philosopher, looking to dissolve some of the paradoxes that have infected philosophical thinking about the mind and body... in particular, he felt the "realism versus idealism" dichotomy was based on faulty logic, a consequence of our bad habit of seeing the "mind" as an isolated, self-sufficient entity whose primary purpose is passive reflection and knowledge-production. Bergson took the rather radical position that "matter" should actually be seen as "images" -- halfway between the conceptual objects of the mind and the raw physical objects of the external world -- and that the universe is a system of images interacting with one another. One of these images, of course, is our body, which breathes air, kicks sand, runs away from danger, and reacts in various other ways to its external stimuli. To Bergson, the body is continuous with the outside universe, and the "mind" is just a part of the body that slows down that process of stimulus and response, so that more pathways and branches of causation can be opened up between each stimulus and its resulting action(s). To Bergson, the way the mind does this is through memory. Most perception, he claims, is actually just memories, conjured up spontaneously to organize the raw data that's always coming in through our senses. It's easy to apply this framework to the Jaeger, the giant robots in Pacific Rim, which are piloted by multiple human pilots to fight the giant monsters called Kaiju. The body is just an image, a construct that reacts to certain stimuli (responding to a jo staff strike by parrying)... the Jaeger is an extension of this body, an image to contain the image, that scales the body up to the size of its monstrous opponent. Deep inside this construct, the human presence provides a narrow but critical function: it allows the responses to be delayed, multifaceted, and complex. It does this by tapping into and intertwining the memories of two pilots, the twin homunculi of this experiment in embodiment. Bergson never uses the term embodiment, as far as I know, but it's highly relevant in this context. It's a noteworthy aspect of Bergson's writing that he sees the mind and the body as essentially inseparable... seeing a flash of light is as much an action of the eye as it is the action of the mind, and shielding the eyes is as much a physical function as it is a behavioral decision. Bergson claimed that the rational behavior of the brain is essentially identical to the unconscious impulses of the spinal cord... it's just that the brain slows the process down, so the response can account for more stimuli at once. It should be noted that the humans piloting the Jaeger are entirely different from the humans in their native form. Operating on a different scale, using a different set of tools, requires extraordinary adaptation by the human mind, to a point where it becomes a totally new kind of entity. To explain why this is true, take a moment and think about the movement of the Jaeger and the human pilots. If the Jaeger were moving at exactly the speed of their human pilots -- action for action, a second and a half for each step, a half-second for a punch -- they would be moving insanely fast, accelerating faster than any airplane, to a degree that would probably challenge credibility of physical laws. For a human, a punch that takes 0.5 seconds has to cover about 2 feet of distance. For a Jaeger, that same punch has to cover... what, 60 yards? A punch that moved an average of 300 feet per second... that's silly, right? That's not just me? That's why the Jaeger always look like they're moving in slow motion... the filmmakers had to make it clear that their every gesture covered an enormous distance, and it would probably take an unnatural amount of time. Of course, the pilots could slow down their movements, right? Just get in sync with their massive avatars? 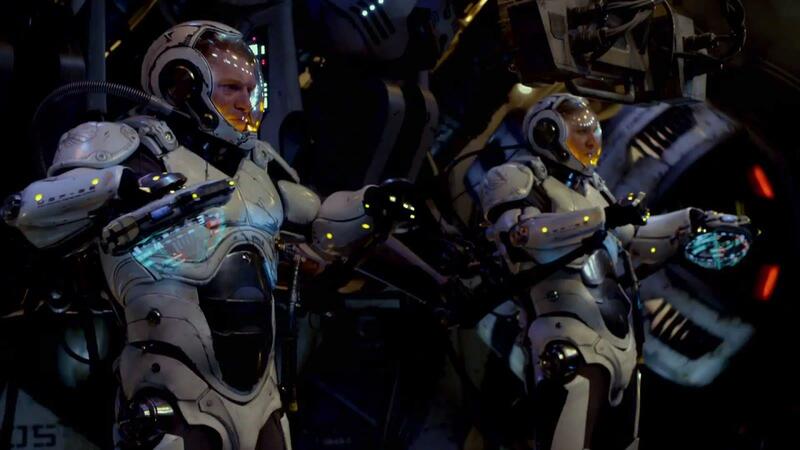 Yeah, but this would get pretty weird-looking in fast-paced action sequences... every punch taking 4 to 8 seconds for the people inside the Jaeger cockpits. It really was better for everyone that the film used editing to gloss over this discrepancy. Anyway, what does this have to do with Bergson? Oh, right! It's the fact that cognitive activity... reaction times, impulses, decisions, the timing and rhythm of movements... is not some kind of isolated process, separate from the physical reality it governs. Thinking is done with the body, as well as the mind. Just as humans have to think on a smaller, faster scale than Jaeger and Kaiju, so it is with other creatures: houseflies, despite having very small brains, have to think on a much smaller, faster scale than humans. When we're going in for a swat, we probably look as slow to the fly as the Jaeger did to us. That's why they can get out of the way so effectively. If that's not enough brain-twisting epistemology for you, Bergson went deeper into how the body actually processes this data. Turns out, he says, the body turns sense data into actions mainly through a process of discernment... it's actually a highly efficient machine for filtering input. Whereas every other image in the universe -- every rock and leaf and air molecule -- has to react to the whole universe all at once, responding equally to every effect, the body is an image that can choose to react to some stimuli and ignore others. In fact, most stimuli don't even reach us, since they have no relevance to us and don't affect any of our five senses. Of the effects that DO reach us, we are extremely good at sorting it out and only letting the most relevant data into our consciousness. We are reductive machines, organizing all input according to our faculties. I think it's very possible that this is what the human pilots are doing for their Jaeger, as well: processing all the input from various artificial sensory organs, prioritizing it, and reducing the possible responses to a manageable subset. This is something a computer could certainly do, but come on... nature developed the human mind as the best possible computer for this type of thing, complete with ethical impulses, survival instincts, and carefully-calibrated judgment. The only problem, of course, is that there is always too much data coming into those spinal conduits for a single human mind to effectively filter. Thus, two humans... two bodies, complete with all their cognitive patterns... two filters for reducing and streamlining that massive flow of sensory data. There you go: a possible interpretation of the cryptic phrase "reducing the neural load." The rest of the stuff in Pacific Rim... the love story, the World War II references, the dubious feminist politics... the other critics can cover that stuff. We can all decide what aspect of this cinematic experience affects us, using these beautiful, strange, reductive brains of ours. For me, it was the subtleties and complexities of embodiment and shared consciousness, and trying to figure out what that might mean. It happens that the best answers I've found are the ones furnished by Henri Bergson, back in 1896.